This new body seems to fit my quite small male hands superbly. The new rounded buttons are much easier to use compared to the X-T2 flat buttons. Faster AF even using the FX 35mm 1.4, other lenses also benefit from the improved algorithm. The improved card hatch and connector hatch are an improvement. I perceive a small improvement in image quality. Also I see the LCD as being sharp as a tack. The EVF is great the detail is super. The menus are familiar but encompass the new facilities. The whole experience of the camera seems slicker and quicker. An almost silent shutter noise is very good. The X-H1 in my eyes is an evolution of the X-T2, which in my mind is better than a revolution. The body feels a lot more robust, time will tell if the finish is as equally robust? Of course all your lenses and most bits fit. IBIS as it does not intrude. The extra 5 ozs of weight. Boot up a tad slower. According to my list the pros outweigh the cons by a fair margin. Another reassuring feature is that Fuji will tweak and improve the camera in the same way that they have done to their other photo products! - all buttons are larger, protrude more, but also the press feels a tiny bit different. Trying to get used to the location of the AF-ON and Q buttons. The Q button, IMHO, is badly located and I have pressed it a few times inadvertently. - IBIS... it works OK. Nothing like the one on an Olympus PEN-F or E-M1 Mark II, but it does give me 2 or 3 stops back, down to 1/4 s - 1/8 s generally. But I also found that it can induce some blur every now and then. Hopefully fixable via firmware update. Oh... it is pretty noisy. - S-AF: cannot see much difference compared to the X-T2, other than in lower light. All the prime lenses I have tested -16, 18, 35, 56- more or less behave the same. I did notice more noise with the 18 mm f/2 though. - Image quality is the same or slightly better than the X-T2, or at least that is what I seem to see without having yet done a side to side comparison. However, JPEG and RAF files at high ISO do look great. My overall take away is that the camera feels solid, but also "half-baked" from a SW standpoint. Hopefully, with time, Fuji will refine it further. I am actually counting on that. I cannot deny that I did have thoughts of returning it because of the software issues and lower than expected reliability of the AF and IBIS, but I am going to give it a chance just because I know the great work Fuji did with the X-T2. On the positive side, because of the non perfect firmware, and because of the release of the A7III, there are already quite a few X-H1 in like new condition for sale on FM for about $1900 with grip. If you also believe in Fuji, go get one of these X-H1 and most likely you won't regret it. I know that many many people are moving to the A7III because of its great price range and features. Hopefully, that will put some more pressure on Fuji to improve reliability and add more features. I also had some thoughts to go try an A7III (and I might still do it, just for fun), but really either the X-H1 or the X-T2 are capable of fantastic image quality. So, personally, I would not trade my Fuji gear to jump ship. Because of the extra resolution on the X-H1 EVF, all the icons and text appear smaller than on the X-T2. That explains why Fuji is allowing larger icons and text with the coming firmware update. The touchscreen operation in review mode works good. Very responsive. It is only in the shooting mode that it is bad, so maybe a software update can address that. Maybe. The touchscreen operation is also particularly bad when dealing with the Q menu and the 4 customizable touch functions, due to the not great accuracy/sensitivity setting. Again, looks like something that could be addressed with a firmware update. The auto DR setting is pretty nice for JPEG shooters, but it appears to do the same thing the DR settings used to do. It lights up the shadows nicely, giving some extra dynamic range. Also, I can certainly see this as a great feature when shooting video. - the touch operation continues to disappoint me. The 4 touch functions get often activated by mistake as I tap to move the focus point. Extremely annoying. Might have to turn them off too. 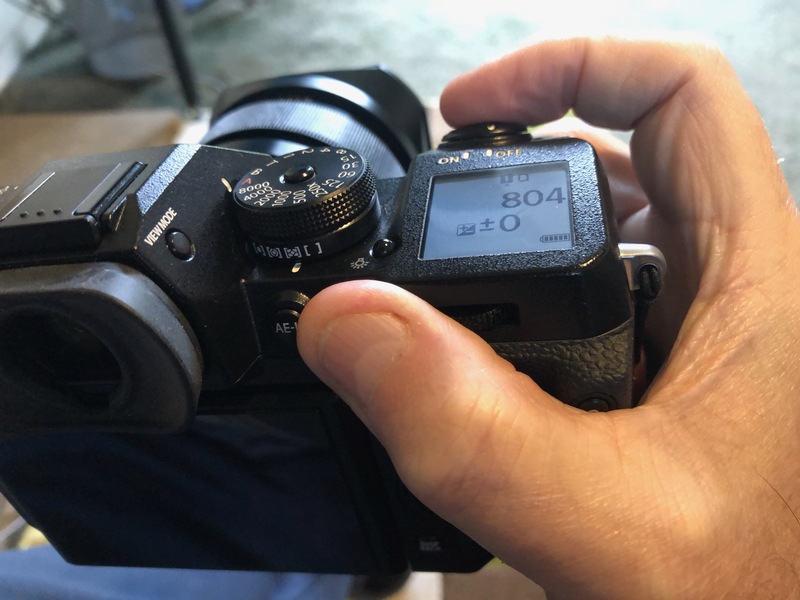 It is starting to piss me off that, since the X-T20 and X-E3 launch, Fuji has basically done nothing to resolve the usability issues of the touchscreen. Even the silent video operation function, that uses touchscreen input to change exposure parameters, is pretty much a fiasco due to the unreliable touch operations. Fuji came with a touchscreen years later after the competition, and still delivered this mediocre/barely usable touchscreen - it makes me mad. Even my old E-M1 and GX7 were miles and miles ahead. I just found a pretty reliable way to use the touchscreen. The 4 touch functions cannot get enabled when the focus point grid is turned on. So, by clicking the joystick before touching the screen (or dragging the focus point) to change focus point location, there is no risk of mistakenly activating the touch functions. Also, because the grid becomes more visible, it is easier to hit the focus point with the finger and that seems to speed up the touch to focus operation. This only works in Area mode though. When the touch operation is AF, the joystick operation becomes locked after you touch the screen -maybe a bug? Also, because the touchscreen does not seem to be as sensitive as what we are used to with our smartphones, better results can be achieved by lightly pushing (and holding) on the screen to increase the touch area. So... don't just tap on the screen. With these two tricks, using the touchscreen to shoot is suddenly considerably better. With great disappointment I’ve just noticed that the AEon and AFon buttons of the Battery Grip don’t take advantage of the larger size as on the camera body, so disappointing Fujifilm! I completely agree. And it is pretty sad that Fuji missed this one, since the grip has certainly been nicely built around the camera, and not as an after thought like the one for the X-T2. Anyway, that flaw aside, I find the camera + grip huge. I really doubt I will be using it much. Alex, it is a biggie ain’t it! I don’t think mine is going to get a lot of use either!! Big and heavy indeed. Maybe I should just sell it and recoup some of the money I spent. I am perfectly happy with the already large size of the camera grip - actually I should really go out and play with it and my 100-400 mm to see how it feels. Shot an engagement shoot - weight is about the same as my G9 with battery grip. Size is similar which when I'm doing paid work shoots is my sweet spot! For larger lenses I love this working with the Fuji 80mm, 90mm and 50-140mm. No real complaints so far. I think the camera is badly represented as a video only camera within the X range which misses the point significantly. I liken it as the 1dx ii to the XT2's 5div. The build quality is just noticeably better, the shutter release is incredibly well dampened and quiet which makes this a real usable tool when shooting inside churches. I tend to think it's very much targetted at the working pro and they have done a fantastic job of this. Guys, size wise, wear would you place the X-H1 body only vs the X-T2 with battery grip? The xh1 is lighter and ergonomically superior. I would agree entirely, the extra weight and size of the X-H1 is over played in my eyes. The grip style is used by many camera brands and there is a reason why that is so! Also there are design tweaks that as Alex notes are an improvement. OK the video capabilities are improved, but doesn’t make the X-H1 a video only camera far from it. Thank you, Alex and Mike. One of my friends who I shoot with wants to buy my X-T2 as soon as we get my Jeep straight. Said friend is also the one taking care of the cutting and welding on said Jeep. I am debating the X-H1 vs the forth coming T3. Ergonomics are a top priority. I have to have at least a RRS plate for the X-T2 to be comfortable. Hi Bobby. Just as an aside and not to hijack the thread, are you still glad you moved from the X-Pro2 to the X-T2? Yes. The X-T2 is much better tool for how I work. But I still have love for the Pro2. My two cents. The IQ of the X-H1 is already very good. The X-T3, even with a new sensor, might not go to a BSI sensor so the IQ improvement might be limited. I think Fuji will introduce a camera with a faster sensor readout and processor/memory to improve on rolling shutter, buffer, and AF. If you are happy with the performance of the camera you have, and IQ is good enough, consider the X-H1. The IBIS really gives new life to the prime lenses, especially when you can use low shutter speeds. If you are after better IQ, again consider the X-H1 today cause the X-T3 will most likely not bring more IQ. If you are after speed, wait for the X-T3. The X-H1 to me is a better camera than video camera. It really adds to the already awesome X-T2. The large grip, the superb EVF, the very good IBIS -for both photo and video, the top LCD are reasons good enough to consider the X-H1 more than the X-T2. Even the 100-400 lens feels good with the X-H1. I’m thinking that the X-T2, especially in its current state, is plenty fast for my needs. ISO performance and ergonomics are the areas I’m looking for improvement in. The T2/Pro2/H1 etc. all have really good iso performance. But I’ll always welcome improvements there. I just got the XH-1, and the simple deciding factor for me was the IS. If I was 20 years younger, I probably would have waited for the XT-3. A tip I stole from another X-H1 user on another Fuji Forum, instead of the supplied VF eyecup fit a GFX eyecup instead, I think the X-H1 benefits from the GFX eyecup especially for spectacle wearers! @Biro I don't know if you saw the latest back and forth I've gone through on bodies. But it reminded me of you asking me this question. The short of it is that I needed some labor intensive work done on my Jeep. The friend doing it wanted my X-T2, so we just did a trade for the repair. Event season was over and there was a great deal on X-Pro2s. So I grabbed one for my personal work and portraits. But I will pick up a X-T3 when they release this winter, a heavily discounted X-T2, or equally possibly a X-H1 for the next event season. When not working I much prefer the Pro2. But when working, or doing video, a gripped body with a tilt screen is the best tool for the job.